Kellogg's characters appeared in a video on Thursday supporting GLAAD Spirit Day and LGBTQ youth. NEW YORK: Mascots can’t talk. But that didn’t stop Kellogg’s famous snack and cereal characters from taking a stand against bullying on Thursday for GLAAD’s Spirit Day, a day of support for LGBTQ youth. Kellogg’s created a video featuring Tony the Tiger, Julius Pringles, Ernie Keebler, Toucan Sam, Snap, Crackle & Pop, and Cornelius "Corny" the Kellogg’s Corn Flakes mascot. 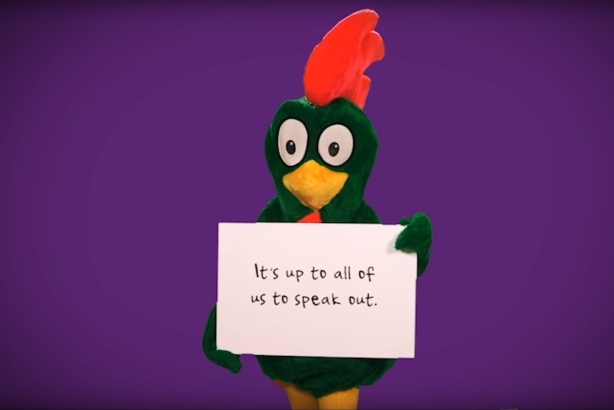 The mascots were unable to verbally communicate, so instead held up signs in the video, starting with the message: "We're here to raise awareness around an important issue. It's not something we can easily talk about. Because we can't talk." Although the video indirectly alluded to ways the Kellogg’s characters may have been bullied – i.e. Tony the Tiger being told he isn’t that gr-r-reat, and Toucan Sam being told his nose is too big – the key takeaway of the video is: "Bullying is no laughing matter." The video was first released internally, said Mark King, global head diversity and inclusion at Kellogg, racking up more than 5,000 views the first hour on the company's internal corporate website, before it was shared widely. "We wanted to create environment where people feel comfortable talking about sensitive subjects," King said. "But we don't want to make light of something as severe as bullying going on. We hoped the video would strike a nice balance, creating an environment where people feel comfortable to raise, what is for some, a sensitive issue." This is Kellogg’s second year participating in Spirit Day. The company is also showing support on its brands’ social media pages and holding an internal learning series about being an ally to the LGBTQ community. The day of support has also expanded to Kellogg’s Latin American offices this year, King said. "Our spirit day activities are one of those things we can all feel very proud that we’ve made a positive impact, not just on business," King said. "This one can have a lasting positive impact outside of business and in our community." Other major brands from banks to sports leagues went purple for Spirit Day. Many showed support online, via tweets and changing profile pictures, while others held internal ally events or changed the colors of their buildings. In all, dozens of companies, nonprofits, landmarks, schools, and celebrities showed support and spoke out against LGBTQ bullying. "What’s great about Spirit Day, companies and brands are coming up with creative and out of the box ways to educate their audiences and consumers about how and why they’re supporting LGBTQ youth," said Rich Ferraro, chief communications officer at GLAAD. This year more than ever LGBTQ youth need to hear they have allies, being bombarded everyday with negative news, bullying and harassment online, in schools, and in the news media, Ferraro added. "[On Spirit Day] we want them to look on their news feed and see positivity, love, acceptance, and support from the nation's biggest brands, landmarks, athletes, and celebrities," he said.